The SONdelux is the first hub dynamo generator specially designed to match with the requirements of modern LED headlights. SONdelux has received the German legal mark of conformity to be used together with the Edelux in all wheel sizes from 16" up to 700c. SONdelux replaces the SON 20R, which is almost identical in construction. SON 20R had the legal conformity for 16" upto 20" wheels only. So now for nearly all applications SONdelux & Edelux are the ideal dynamo powered lighting system providing maximum illuminance at minimal physical effort. The SONdelux works fine with other high-end LED-headlights, such as the Lumotec IQ Cyo by Busch & Muller, however without legal conformity in Germany. The model for disc brakes has a centerlock mount. The SONdelux is as robust as the SON 28 with the same high-quality finish. It is much smaller in size and more light weight (390g). So it is attractive even for elegant road bikes. What else do I need for the dynamo hub setup. 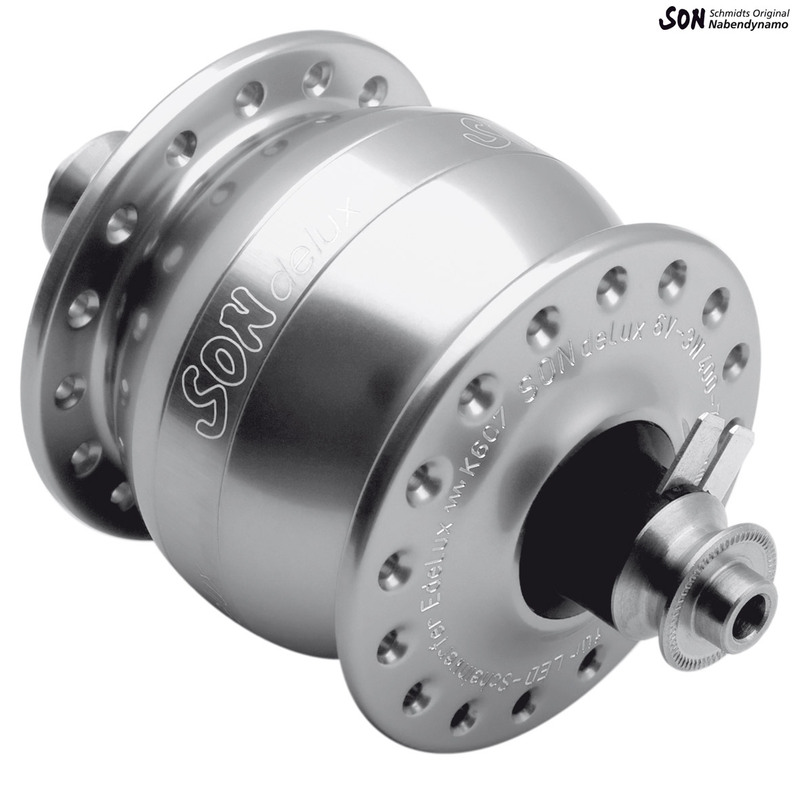 I'm thinking about buying this son delux anodized 36 spoke hub. I'm currently on a world cycle tour...soon to be in Hungary. (I notice that you post here but for a cost of £25). I think this hub is suitable for the 20" front wheel 36 spoke on my recumbent. However it is not clear to me what else I need to buy to use this as a power source for charging my devices. I have a power pack that I currently charge with solar panels and usb to use micro cables. What setup would you recommend and could you do a deal for me if I buy the whole setup from you? This hub would indeed be fine for use with a 20" wheel. As well as the hub you'd need a dedicated USB charging device, that converts the hubs output to a safe and usable form from a USB port. The charger we recommend is the Sinewave Revolution which is SJSC part number 43658. We offer all of these items at the best price we can so we are unfortunately not able to do a package deal.